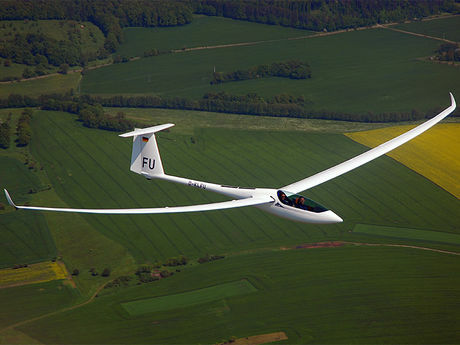 Among our clients arose the idea of a self launching glider with an electric(E)-engine which ideally would combine the performance of the EB29 with a seat for a Co-pilot. Based on the single seater EB29 we stretched the fuselage in the cockpit area by only 25cm and increased the width by a few centimeters to generate the room for a Co-pilot. In addition we redesigned the complete control mechanism in the cockpit area in order to assure comfortable seating positions for the pilots in this very slim and elegant fuselage together with an ergonomic cockpit layout. So the EB29 was transformed into the EB29D, a self launching racing-two-seater which truly defines a new benchmark. The new EB29D made its maiden flight on May 28th 2013 on the airstrip of Büchig near Ostheim vor der Röhn, its E-Version EB29DElektro already in November 2012. To minimize the structural weight the main parts of wing and fuselage are built using the vacuum suction method. This allows the utmost possible spread in wing loading.